There are many excellent Commander Shepard cosplayers in the world. 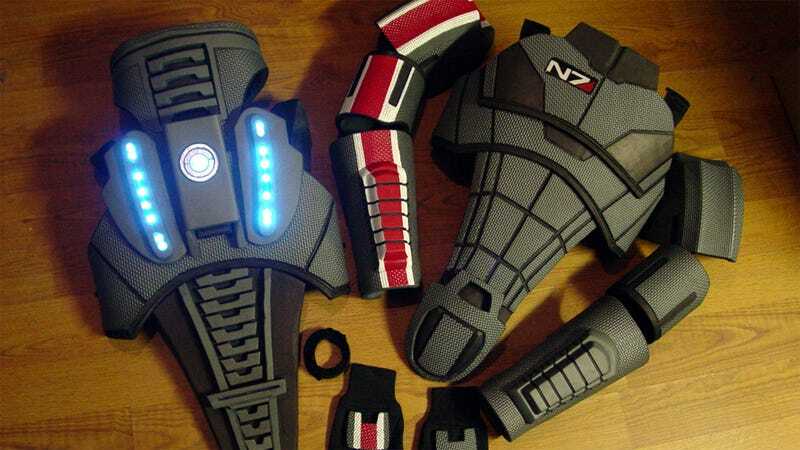 Each and every one of them them is to be commended for the sheer amount of time and effort they put into recreating and personalizing the commander's iconic N7 armor. And then there are people like me, who should not be allowed within twenty feet of power tools or hot glue guns. If you, like me, are better with digital creations than physical ones, well, you're in luck. Craftsman David Carpenter, through his site BioWeapons.com, is offering full sets of N7 armor for sale, in both male and female varieties. The bad news is, the full set—legs, torso, arms, gloves, gun—will run you $1250 if you are a DudeShep and $1350 if you are a FemShep. Suddenly, braving the hot glue gun doesn't seem like such a bad idea after all. For more examples of Carpenter's fantastic props and costume work, peep his Facebook page and his BioWeapons site.